As an advice blogger, I often give advice on a variety of unique topics, and while they're unique, they can actually happen quite often. 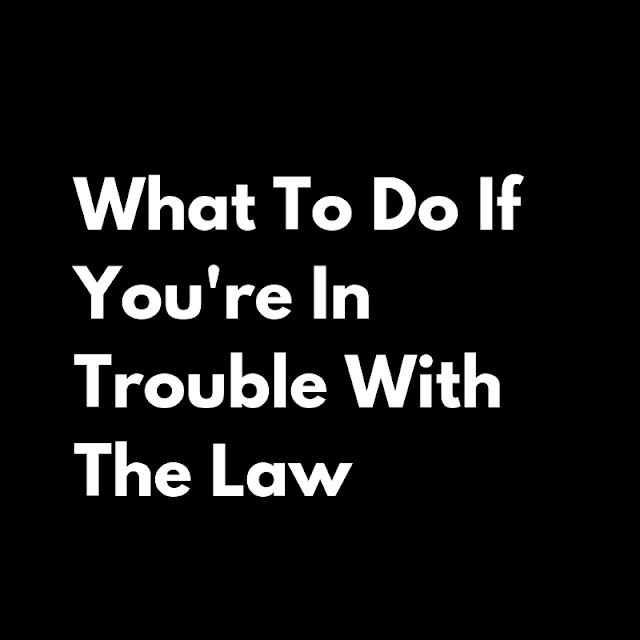 Today I want to talk to you about what to do if you break the law and get in trouble. Obviously, you shouldn't break the law. But, this post is about what to do if that ends up happening. This can apply to anything from a traffic ticket to something WAY more serious. So what do you do if you break the law? It can be terrifying to have an encounter with law enforcement even if you're normally a law abiding citizen. But the best advice I can give you is to remain calm and level headed. If you let yourself panic you can start to THE WORST thing of all, which would be trying to flee or escape. That will only lead to more issues and it can't work in your favor no matter who is in the wrong. Take a deep breath. Keep your cool. Speak politely and be honest. If the person being questioned is someone that you are with, just know that you are responsible for your own actions so no matter how they act, make sure you are mature and level headed. It will go a long way in court. 2. Know your rights but be reasonable. Do some research into your legal rights as a citizen but don't get pushy. Sometimes people know they did nothing wrong and when an officer approaches them or comes to their house they become aggressive and angry. Even if you know that you're in the right and they're in the wrong, be reasonable and just go with it. It's always best to seek help afterwards to right the wrong that was done to you than it is to fight and do something wrong on your end. A criminal defense attorney like Mike G Law can be very helpful for your case. A criminal defense attorney can speak with you about your charges, your rights, and what your options are moving forward. You'll need to gather some money in order to pay a good attorney to help you out and you'll need to be honest with them about what happened. Remember that they are on your side no matter what, whether it's to prove your innocence or to give you a fair trial. Listen to everything they tell you and take lots of notes. Keep in contact with them over the next few months and the entire time you work with them until your situation is resolved, no matter what the outcome. 4. Get support from your friends and family. Whether you were in the right or in the wrong, a good support system can help you get through the weeks and months ahead. Explain the truth of what happened and let them know how you feel. You don't want to try to hide things and keep everything inside because it can really stress you out. At the same time, don't divulge too much information to those that you feel you can't truly trust. At the end of the day, no matter what happens remember that staying calm and investing in a reliable criminal defense attorney is your best bet when you're in trouble with the law.